It’s one of summertime’s simple pleasures: sugar, water and food colouring, frozen together in perfect harmony. Freezies! Who doesn’t love these things? Whether you’re a kid or an adult, Freezies are the quintessential way to cool off during the summer months. 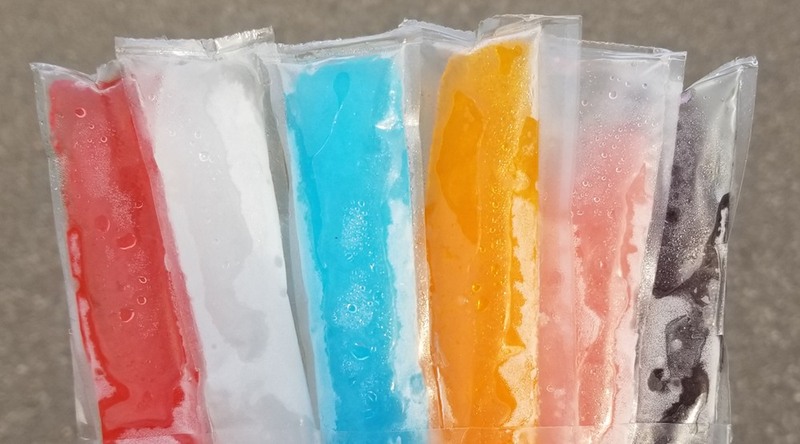 Who doesn’t have fond memories of stealing a strip of Freezies from the freezer, ripping the tops off with your teeth, enjoying that sweet, sweet artificial nectar and then guzzling the melted Freezie juice like was the last drop of water in the Sahara Desert? Just in case you haven’t had one since your younger days, yes, Freezies are still around and they’re still enjoyed by the handful because nobody ever has just one. While every flavour has its own charm, let’s be real, some Freezie flavours are better than others. That’s why certain colours get gobbled up right away, while others get left in the freezer for months, if not years. For the most part, there are only six classic flavours: grape, orange, cherry, cream soda, watermelon and blue raspberry. In some realms, you may come across the odd peach, banana or apple flavours, but for the purpose of this list, we’ll stick to the six classic flavours. In no uncertain terms, this is Daily Hive’s definitive ranking of Freezie flavours. Cherry also ranks last because out of all the flavours, it’s the most likely to leave stains on your shirt. At least one drop from every cherry Freezie always claims a victim. You know how hikers going up Mount Everest often discover fully frozen hikers who met their demise? That’s what happens to orange Freezies. Orange is a safe and reliable choice in terms of Freezie flavours, but there’s absolutely nothing special about it. Orange is the Toyota Corolla of Freezies – it’s inoffensive, it does its job, but ultimately, orange leaves you longing for something a little more exotic. Exotic … like watermelon, perhaps? Traditionally, watermelon is one of the summer’s most beloved and messiest summertime foods. And the watermelon Freezie is no different. Next to the critically acclaimed watermelon Jolly Rancher, the watermelon Freezie comes a close second for the best adaptation of watermelon flavour ever concocted. It’s a middle-of-the-road flavour; you’d be happy to have watermelon in your handful of Freezies, but it ranks further down the depth chart compared to other classics. Hands up if you just realized the white Freezies were actually the flavour of cream soda? It’s one of those things you just accepted as a kid and never questioned. Most people think of the colour pink when it comes to traditional cream soda, which is why some Freezie fanatics grew up oblivious to the fact that it wasn’t just “white” flavoured. The bridesmaid of Freezie flavours, grape did everything it possibly could to become the best Freezie in the bunch. For generations, grape freezies have turned people’s tongues and teeth purple, inciting dentists everywhere. Some of the best memories from summers’ past involve buying a 25-cent jumbo Freezie, chomping down on the purple goodness and drinking the remnants until your teeth hurt and your eyes started to bug out. In retrospect, it was probably a lot of sugar for a small child to consume in one sitting, but purple Freezies made you feel a vigour for life. Grape is the classic “kid” flavour. The irony is, as children, we may have romanticized what grape should taste. Just like grape pop and grape candy, grape Freezies taste nothing like the fruit itself. Regardless, it’s a damn fine Freezie flavour and comes a very close second to the best flavour of them all. Has anyone ever encountered a blue raspberry in real life? Much like the cream soda Freezie, blue raspberry doesn’t really taste like it looks. The flavour is a bit of a misnomer as it doesn’t really have a raspberry flavour to it, but it does have a certain tartness, which makes it unique. Blue raspberry is anything but basic; with its windshield washer fluid-like appearance, it made you feel like you were consuming something that may cause blindness. The truth is if you eat enough of these Freezies, your vision will get blurred. According to the official Kisko Freezie folks, blue raspberry is their number one flavour, followed by cream soda, cherry and grape, with watermelon and orange bringing up the rear. Blue raspberry will always be the best Freezie because it personifies what summer should taste and look like. They symbolize hope, freedom and innocence; something you can’t help but experience every time you crack open a blue Freezie.